For my seminar „Games, Play and Education“ I’ve scraped together (via skinning, modding, recontextualisation) three minigames. These should serve as an intro to the three learning paradigms of Behaviourism, Cognitivism and Constructivism and their possible realisation in games via their very different gaming mechanisms. 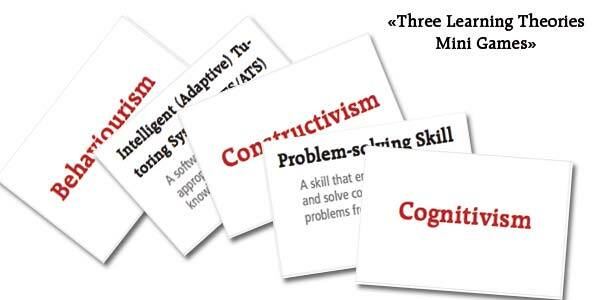 The 32 cards and the rules can be downloaded as printable PDF (three pages) via this link: ThreeLearningTheoriesMinigames. Due to division in small groups of four students all games are scalable to any reasonable seminar size, i.e. 8-24 students. 20 paper strips per group, a stop watch or something similar per group, and at least a rudimentary knowledge about the three learning paradigms. Discerning learning paradigms represented in the rule system of different games, discovering that knowledge about categorisation, definition and connectability can itself be a playing material. 32 strips of paper with learning theory terms and proponents from the ‚big three‘ learning paradigms, stopwatch. set of concept-cards for each group. Dieser Eintrag wurde veröffentlicht in Didaktische Spiele, education, gamedesign, games, metagames und verschlagwortet mit behaviourism, cognitivism, constructivism, game, gamedesign, learning theories, rule dimension, rulespace von Wey-Han Tan. Permanenter Link zum Eintrag.